Dimensions 605'4" by 64'11" by 17'3"
1942: 2x4 40mm/40 and 7x1 20mm Oerlikon AA guns added to light antiaircraft battery, along with Types 273, 281, and 285 radar. Two single 40mm/40 guns removed. 1944-8: 2x4 40mm guns and remaining single 40mm guns replaced with 2x8 40mm guns. The Hawkins were large cruisers specifically designed to hunt down commerce raiders the Germans let loose in the Atlantic in 1914-1915. Because the raiders had good speed and 6" guns, the Hawkins were given more powerful armament than was then the standard in cruisers. 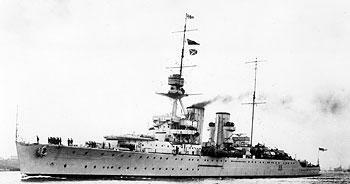 Completed in 1919-1924, they became the basis for the heavy cruiser type recognized by the naval disarmament treaties. The ships were originally designed for both oil and coal burning so that they could operate independently around the world. They were among the first to use the concept of an armored box around the magazines, but they lacked good machinery dispersal. By the time of the Pacific War, they had been modified extensively, so that there were significant differences between the various ships of the class. We list here the characteristics of Hawkins, the only unit to see service in the Far East.